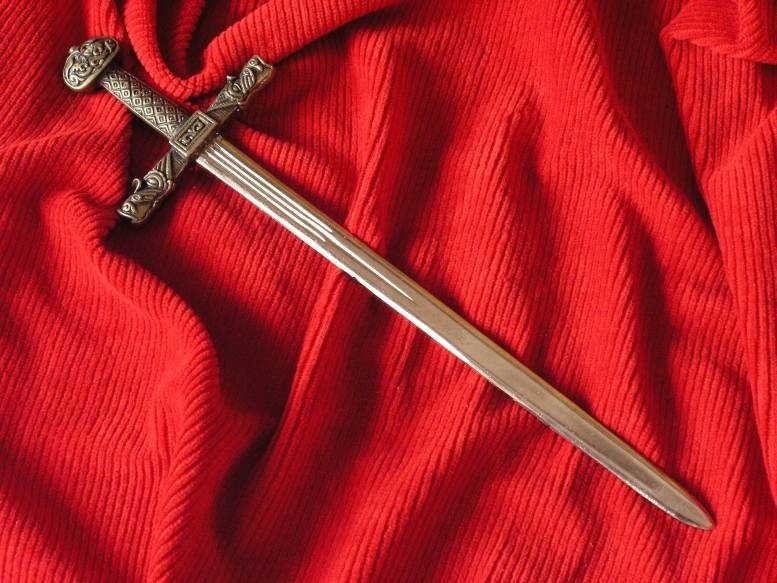 A sword took various shapes and names over the centuries, but its purpose was always the same. It was supposed to inflict blows to the enemy and protect the warrior from injuries. In order to produce it, the most innovative technologies and the highest-quality materials were applied; and their creators could boast a true mastery of their profession. It happened that from a functional tool, a sword took the form of a work of art, which was carefully cultivated, respected and passed to the younger generations. However, most commonly it wore out in battles and exercises or aged as the time went by. Then, it was changed for a new one, what made the demand for medieval armorers' products everlasting. 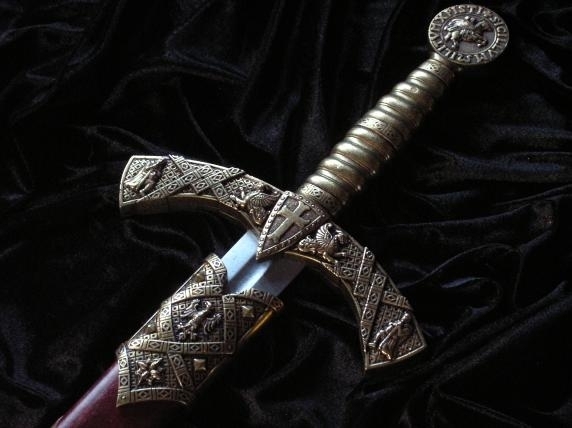 Another function of the weapon, especially in the Middle Ages, was to serve as the owner's status symbol. A sword could be possessed only by a gently born man, what was reflected even in the executioner's equipment. Only a nobleman could be cut off with this weapon. A sword also constituted a power and strength symbol. It happened that it was given a name and praised in epics. Durandal and Escalibur can serve as the examples from the history of literature. On the other hand, a shield was the opposition of a sword, because it was on it where the force of the blows was focused. It was also mentioned by bards in their songs, for example the one which protected Sir Galahad, a knight known from the Arthurian legends. As they suggest, there was a red cross on this shield, marked with blood by Saint Joseph of Arimathea. 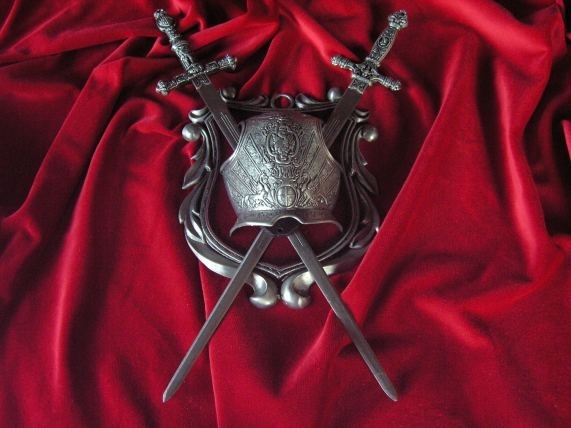 In the Middle Ages, both swords and shields started to have not only the practical functions, but also served as their owners' signs of recognition. The armaments of a warrior could have also been endowed with an axe, an armor, a helmet, a spear and many others. This equipment was evolving over the centuries, along with the changes of the battlefield demands. The research of the armaments history is not easy. It is mostly because there are not enough exemplars showing different periods. It is a result of a previously mentioned exchange of the old and damaged weapons to new ones. The specimens which survived in a good condition to the present day were the gala swords that carried a symbolical meaning. These were, for example, coronation swords, the spoils of war or heirlooms. The knowledge of weaponry should not be entirely based on its depiction in the iconography or sculpture, as the imagination of an author could have had a great impact on the presented image. People are often vain, so they want to be shown as impressively as it is possible. That is why it is supposed that, for instance, in case of gravestones, the dead ones in fact did not had such rich armaments as they are depicted with. In reality, they could have had only a part of it or a simpler version, which we have no knowledge about. It is one of the reasons why there is no single united terminology of the data concerning the armaments and they can be named variously in different parts of the world. Among the blade cold steel, two main types can be distinguished, namely a sword and a sabre. The most noticeable difference between them is the shape of a blade: in case of a sword it was double-edged and straight, and in a sabre – single-edged and curved. Depending on a given kind, the structure of a sword may slightly differ, but it is worth to mention the common qualities. Most commonly the assembly of a hilt began with placing a guard, then a grip and a pommel on the stem of the blade. Next, a blacksmith had to press a pommel adequately and unrivet the end of a stem protruding from it. As a result, a hilt and blade were united in one piece. In the hilt assembly process, precision of making the through holes on the surfaces of a guard, a lining and a pommel was crucial, as well as the technique of the stem's removal. It should only be forged, almost without the use of a file. A pommel and a guard were most often made of steel, although some older swords (11th-12th century) had bone or horn pommels and guards. It happened as well that the steel pommels were empty inside, so they were in fact tins produced from a 1-3 mm wide metal sheet. In case of longswords, however, a full steel forge was applied, as these weapons demanded a different balance and, at the same time, a more massive pommel and a more resistant guard. A core of a hilt was usually made of hardwood, making the lining of a hilt. Usually, it was covered with leather and wrapped with wire or a strand of wire, which sometimes went around the lining in a spiral groove. These practices were aimed not only at strengthening a hilt, but also to facilitate a firmer grip. Sometimes the cores were made of antlers or leather patches strung on a hilt's stem in a pyramidal shape. A sword was created in the Bronze Age, along with the emergence of metallurgy. All the ancient cultures knew this weapon, but it was particularly important in Rome. Initially bronze, then iron swords contributed greatly to the conquest of the world. The most characteristic one was a short gladius, which every Roman soldier was obliged to possess. Ancient swords usually had a short blade, measuring 60-70 cm. They were designed, therefore, for stabbing mostly, sometimes for chopping also. They almost completely lacked guards. The Celtic La Tene swords stood out with their blade length, what was a prototype for the medieval weapons. Instead of a guard, a metal slat appeared there. As the time went by, bronze was replaced with iron. In the Merovingian and Carolingian times (8th-11th centuries), there was another revolution. Namely, the Viking sword emerged. It is named this way, because the greatest amount of its exemplars are discovered in the Scandinavian countries, but in fact their blades were mostly coming from the workshops located on the Rhine. In this kind of a sword, a fuller can be noticed for the first time, what made the weapon lighter and more resilient. It was equipped with a guard as well, short at the beginning, but still providing some protection for a hand placed tightly between it and a richly ornamented pommel, made in a fan-like shape. A pommel, along with a guard, was studded and plated with silver and gold, which created a true work of decorative art. The whole length of a sword measured to a maximum 1 m. Along with the changes of the protective armor and the fighting techniques, the weaponry was also modified. The shape of a pommel started to resemble a flattened half of a circle, while a guard was improved and, at last, it constituted solid protection for hands. A blade, which had quite a parallel shape so far, started to noticeably taper to a foible. In the 12th century, the army was divided into the cavalry and infantry, which used to fight with axes and pole weapons before. In the 13th century, a longsword was invented. It had a heavy, over 1 m long blade. In order to use such a weapon efficiently, it had to be equipped with a huge pommel for a counterbalance. Most commonly, it was shaped into a lens or a disc and such an ending started to be the most popular over the centuries. While talking about knights, we usually imagine such kind of a sword. The last significant modification was the emergence of a sword having a blade without a fuller, but with a convex ridge. Both these types coexisted up to the 15th century, when the model with a ridge became much more common. The rest of the elements underwent some changes as well, depending on a given period and place of production, but the idea was always the same. One-handed swords were the most popular, but sometimes there appeared also “hand-and-a-half” or, impressive with their size (2 m), two-handed models. The specimens called “bearing swords” reached the record length 226 cm. The Prince of Wales, Edward, equipped his guards with them, so as to emphasize his social position. Such weapons were probably not used in practice. However, 1.5-1.8 m were actually fought with by German Landsknechts and Swiss infantrymen, stating for truly terrifying weapon in skilful warrior's hands. Interestingly, their blades had a flame shape (flamberg). Another two-handed sword worth mentioning was a Scottish claymore, equipped with a characteristic guard, lowered at a quite big angle, with ends shaped like rosettes and a prolonged blade. This kind of weapon was used until the 16th century, when a sword began to lose popularity. It started to carry a more symbolical meaning, as a reflection of the ruler's power or as an outstanding gift. However, as a result of the protective armaments' modifications and new combat techniques being applied, it lost its battle function. It was still used by the executioners (in the form with a rounded foible) who cut heads off with the help of this weapon. Whereas in the battlefield, a sword was replaced with a rapier. In the 12th century, a sword was the main weapon of a knight, who was a gently born person. Therefore, it remarkably symbolized the social status. It was supposed to remind a warrior that as his weapon is clean and shiny, he should be honest and sincere. Two sharp edges of a blade symbolized justice and nobility. When a boy was already 7 years old, he started to learn the knight's craft. A knight's son was spending his childhood mostly on strength exercises along with horseback and swordsmanship trainings. Usually he practised at the court of his father's lord. Firstly, he was a page-boy, then a squire and when he was 16-18 years old, he was finally knighted. During that ceremony, a new knight was hit in his arm with a sword and then given this weapon. From this moment on, it was his inseparable companion. Sometimes it was even put into his coffin. When the last male of the family died, his sword was symbolically broken. This weapon was attached to the left side, but when a longsword appeared, it started to be carried in hand, hidden in a sheath entangled with a belt. As it has was cross-shaped, it served also as a Christian symbol, which a knight prayed to before a battle. To endow it with additional power, some religious evocations or even spells were engraved on the blade. A pommel sometimes had the function of a reliquary, as remains of a saint were placed there. During a combat with a sword, the most important thing was to strike a cut that would break the enemy's defence. It was not difficult to counter such a blow, as it could be recognized by the body movements. The fight ended, therefore, usually because of a mistake made due to fatigue or the devastation of a weapon. In fact, the fifteenth century codes contain descriptions of a wide variety of blows and counters that could be performed using various types of weapons, but they were only used by the so-called masters of the sword. Such knowledge was useful during tournaments and duels, but in the battlefield, warriors fought usually in one-on-one combats, where strength and reflexes were decisive. More attention was paid to fencing when the era of a rapier came. Our sword shop offers you remarkable copies of various kinds of this weapon that will allow you to feel like a warrior of a given historical period. You can find out what was the real weight of an armament and how it fitted a hand. A sword replica is also a great teaching material, used for instance in historical reenactment. It enables the performance with greater level of realism and credibility. 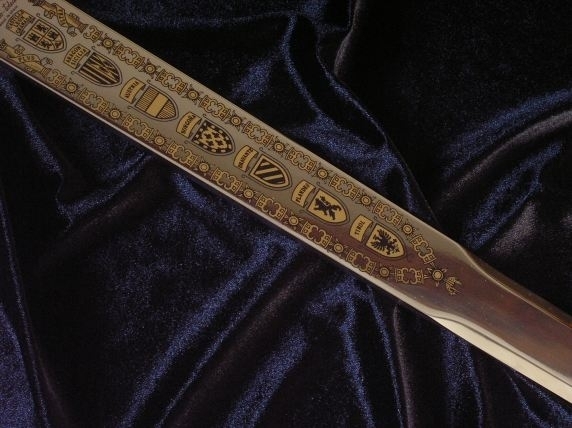 What is more, a replica of a sword serves magnificently as an exclusive interior decoration or a collectible.